It has a well-established reputation for providing high quality concrete to both low and high volume users at competitive prices. The company credits this reputation and sales on its ability to effectively provide technical expertise for difficult jobs. They have a long-standing reputation among contractors for timely deliveries of quality concrete and technical know-how. The company operates out of a new “state of the art” batch plant capable of 120 cubic yards per hour. The plant is enclosed for all weather service. 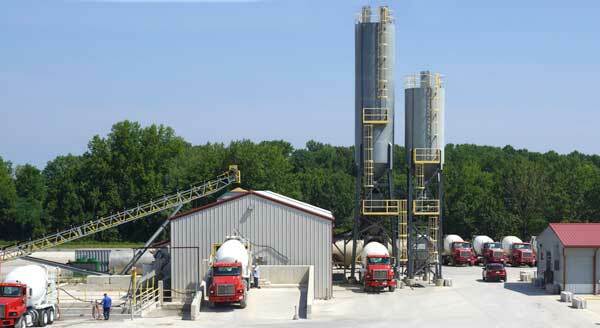 Mixes are available utilizing straight cement, cement and class F flyash, and cement and newcem (GGBFS). Mixes are available with standard #57 crushed stone, #78 or #8 crushed stone, and #8 river gravel. Standard flowable fill, as well as, pumpable flowable fill and various grouts are also available. Custom mixes (ie. Lite weight, 8 to 18, etc.) are available with prior notice. Enclosed plant with a 2.8 Million Btu per hour, 10,000 gallon Hot Water System for in spec concrete temperatures during below freezing weather and heated saddle tank water. Batch water blend valve for precise control of batch water temperatures. State of the art computerized batch system with manual backup. Crushed stone, river gravel, concrete sand, mortar sand and run available. Precast septic tanks, distribution boxes and retaining wall blocks available.